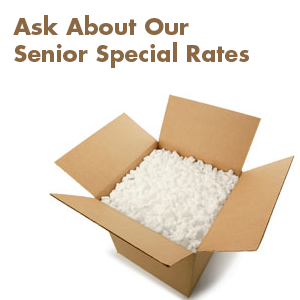 All Around Movers, Inc of Portland, Salem, and Eugene, OR has all the materials you need to properly pack your belongings; Unprinted newsprint, tufted paper padding, bubble wrap, packing tape and boxes. Items such as antique furniture, marble and glass top tables, trophies and chandeliers are best transported in custom-made crates. Ask us who we recommend to crate these items when necessary. Please review our helpful tips so your move goes smoothly. Pay special attention to the items we are unable to move. Notify the post office that you are moving. An online Change of Address form is available on the United States Postal Service Web site. Start packing as soon as you find out you’re moving. Pack items first that you don’t use often. Never pack flammable items or non-allowable items. Use generous amounts of paper inside the carton on the top and bottom to provide good cushion. List contents and room on the outside of the carton. Clearly mark “Fragile” on the outside of cartons. Use clean newsprint paper. Old newspapers may work, but use them carefully because the ink may rub off onto your items. Clean “newsprint” paper is available from your local agent. Write “Open First” on cartons containing essential items such as cooking utensils, toiletries, etc. Separate breakables and non-breakables. Pack all cartons tightly. Use professional packing tape and strong boxes to be sure they withstand the move, keeping your belongings safe. Masking tape isn’t strong enough to support fully packed cartons.